This is the second part of a series on developing our God given purpose and calling. We pray the notes will guide you in the direction of more fruitful ministry. Many of us use the “trial & error” method of finding our place in the Body of Christ – motion without movement. This may eventually lead to a meaningful place of service, but there’s a better way! God has gifted all of us in multiple ways to accomplish His will in and through us by serving Him in line with our passion, gifts and personality. Notice the illustration below showing three main areas of our lives that need to be identified and applied. In this way we will be able to make a significant impact in the Kingdom of God by being who God created us to be and doing His Will with results. 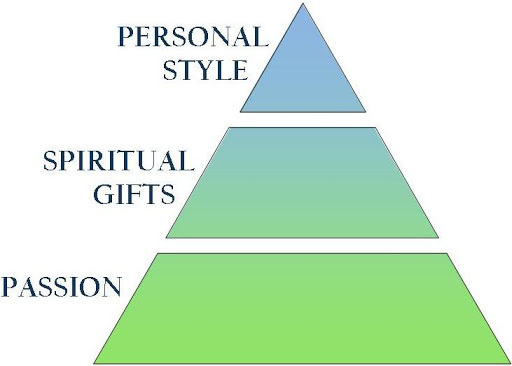 Identifying our Spiritual Gifts requires an extensive survey. Because of that we will simply address the process of identifying our passion. Please contact us if you desire the complete set of notes which include the Passion, Spiritual Gifts & Personal Style Surveys. DEFINITION – Passion is the God-given desire that compels us to make a difference in a particular area of life or in a ministry. It answers the WHERE issue. Go through the following questions and honestly take time to identify where your passion may lie. This will require a time with no distractions. Reflect on the following Questions. On separate sheets of paper, answer the following questions. Do not answer these questions in light of what others may want you to say, make them totally yours. 1. What people group do have a deep burden for (infants, teenagers, homeless, inmates, etc.)? What social issue greatly burdens you (AIDS, oppression, reaching the lost at home or abroad, et.)? 2. If you knew you couldn’t fail and would have the necessary resources, what would you do? Be specific. 3. What situation do you see that concerns you which, if changed, would be more glorifying to God and help others? 4. What do you truly and genuinely care about? Identify those things. 6. List the top most meaningful and positive life experiences at home, work, school, etc. Briefly describe what you achieved and why it meant so much to you. 7. In light of the information above, write a brief paragraph stating what YOU believe to be your God-given passion and purpose in life. 8. What do you need to start doing now to get to where God wants you to be? Write three goals and attach a due date to each one. NOTE – Contact us if you desire to have a complete set of notes which includes the Passion, Spiritual Gifts and Personal Style of Ministry surveys. This entry was posted in Purpose Part 2 - Passion. Bookmark the permalink.